This post is directly from the Healthy Art Program: An Energy Smart Exhibition blog that I wrote. The past few weeks I have been working on my pieces for the Healthy Art Program: An Energy Smart Exhibition. Admittedly it’s been more difficult than I anticipated. I was struggling with the content/subject. Most of my artwork is already directly inspired and influenced by nature and natural history. So why would I do anything different? I know whatever my subject is that it will relate to the environment. Does this make my work Eco art? Is this the point of this project? In a general sense, [Eco-art] is art that helps improve our relationship with the natural world. There is no definition set in stone. This living worldwide movement is growing and changing as you read this. Much environmental art is ephemeral, designed for a particular place (site-specific) and involves collaborations between artists and others such as scientists, educators and community groups. See "A Brief Introduction" by Clive Adams of the Centre for Contemporary Art and the Natural World. The more I thought about it the clearer it became that for me this should be about the materials and process. My art subject already speaks to some of the above statements and for me, this project isn't necessarily about making eco art. What I want to explore is a more practical approach; like how to use new materials, how to reduce waste. Is this something that is cost effective, easy, and convenient? Materials are expensive already, will using earth friendly products cost more, are they harder to obtain. So while I am making my artwork I am also doing a lot of research. I think it is worthwhile for artists to use earth friendly materials even if they are not “eco artists.” I have been experimenting with making my own paints, oil and tempera, as well as finding non toxic solvents, earth friendly paper and other goods. I have also been measuring my energy use. Although I am not quite sure aside from the basics (CFL or led lights, etc) of how to change that. 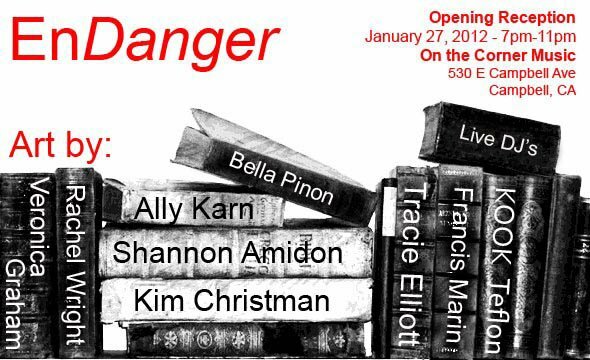 This Friday there is an opening reception for an all woman group show I am in. You should come by and check it out. In other news, I recently volunteered to teach a class of high school seniors about encaustic art. It was a great experience, all the students were very considerate, polite, creative and very talented. At first I was a little apprehensive because I have never worked with high school students, especially not 30 of them. I wasn't sure how they would respond to me or the art. I gave them a quick overview of myself and the process and them cut them loose. I didn't want to give them too many restrictions as this was more about learning the materials. All of them created great pieces and the teacher later told me they had wonderful things to say about the lesson. It was a really fulfilling and fun experience that I hope I can do more of. I also have a few other things in the works, I am working on some art for City Hall for the Eco Art Grant project. Busy making lots of new artwork for a feature show in April - more info on that soon. Plus I am learning how to make my own Eco friendly paint and will be giving a demo at Kaleids next Two Buck Tuesday event. That's it for now, I am sure there is something I am forgetting but I just wanted to start somewhere. It’s time for my year in review blog post. 2011 was creatively and professionally an amazing and really, really busy year for me. My year began as I was returning from a month long Artist Residency in Costa Rica. I returned invigorated and inspired. The residency experience was a wonderful one and I was hooked. In January I participated in the very first ever SJMADE event and it was a fantastic success. February was an awesome month; I was interviewed on a live TV show called Talk Art. You can watch the episode by clicking here. It was a new experience that I had a lot of fun with. My bullet shell jewelry was also named in Silicon Valley Metro’s best of issue.In March I had a solo exhibit at Good Karma. I think April might have been the climax of my year. I was named the Arts Council Silicon Valley artist laureate in photography and received an Artist Fellowship Grant. I was also featured in a really well written and brilliant full article in the Silicon Valley Metro. The summer months of flew by with Open Studios in May, SubZERO Festival in June and First Friday Art Street Markets in August & Sept. September also brought another successful SJMADE event. In October I was awarded an Eco Studio Makeover and grant from the Art Inspectors Healthy Art Program. I am really excited about this program and will have lots to share about it in the including an exhibit at City Hall. October also marked the beginning of my new blog San Jose Creatives which features weekly interviews with the creative community in San Jose. I am really excited about this little project. It has received a lot of great feedback and I am meeting so many wonderful people. If all this wasn’t enough at the end of October I flew to Iceland for another artist residency at Herhús in Siglufjördur. It was such a magical and incredible experience. I worked on a new series that I will be exhibiting in 2012 and had lots of adventures. November and December had a couple more solo exhibits. Kanji Garden, a site specific installation made of hundreds of hand dyed and folded books at Phantom Galleries and my Efflorescence series was exhibited at the Saratoga Library. In November I was featured in a beautiful and insightful article and interview in Content Magazine. It was so great meeting the Content crew and working with them. December also brought Hark the Holiday Show at Kaleid Gallery. This year I also started to show and sell my artwork and jewelry at Modern Eden Gallery in San Francisco and The Bone Room in Berkeley. As you can see my year has been remarkable and filled with many wonderful events and opportunities. I am so grateful for all of the wonderful and supportive people in my life. Your belief, support, friendship, and encouragement mean the world to me. Happy New Year! I wish you and your loved ones a creative, happy and healthy New Year filled with lots of adventures. Here is to making 2012 an even better year! Keep pushing, keep fighting and never give up. The Art Inspector came to my studio a few days ago and gave me some new materials and took away a lot of my current ones. I was given Red River GreenPix Photo Matte paper, FSC wood panels, raw pigments, eco glue and sealer. I will be receiving bees wax and watercolor paper soon. She took away quite a few materials including my sealer, oil paint, adhesives, and paint thinner. One thing we talked about that really peaked my interest was about the amount of waste that is created from art making and how that impacts the environment. I am a materials based artist, my materials and processes are very important part of art making for me. Although I try and reuse and recycle a lot of objects for my art, at times I have a lot of left over materials/garbage. I am really interested in creating without wasting. An example of a process that creates a lot of waste is my photographic encaustic work. I use a large amount of paper towels, rubber gloves and electricity. Digging down even deeper I have a lot of my materials shipped to me. The boxes and packaging that they come in are waste. If I print my own photos there are the paper trimmings, empty ink cartridges and the packaging they come in. It’s all very interesting to me and something I really want to explore further. I am an artist whose primary inspiration and subject matter is nature. It bothers me that I have not really thought about how my art making process impacts the environment.